Finance is the strategic allocation of resources—stocks, bonds, and more—to increase value for an individual or an organization. 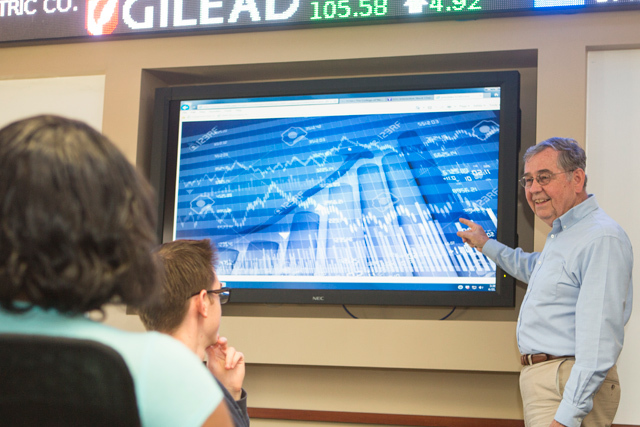 The study of finance teaches students to analyze financial data and market trends—and their ramifications—to make sound investment decisions. Finance professionals work in many settings, from banks to brokerage houses, from major corporations to government agencies. The hallmark of the finance program is the integration of a core business foundation with the specialized knowledge and applied skill of the finance professional. Classes are small, discussion based, and led by faculty who bring the insights of professional finance careers to the classroom. Our students learn finance by doing finance, from managing an actual portfolio to accessing the same real-time global financial data as professionals. Finance is one of the four specializations students may pursue in earning a Bachelor of Science in Business Administration (BSBA). Analyze stocks and make investment decisions using real money, managing a portfolio valued at $350,000. Access real-time financial data, news, and markets just like professionals do, via a Bloomberg terminal. J.P. Morgan, Johnson & Johnson, Goldman Sachs: Major firms in nearby NYC and Philly value our students. The finance specialization within the BSBA program builds on the school’s Common Body of Knowledge, a required core of courses in accounting, economics, statistics, and other business disciplines. After an introductory course in finance, students complete a course in investments that aligns with the exam content for the professional certified financial planner (CFP) designation. A one-year cycle of courses in corporate financial management uses MBA-level texts and combines financial theory, case studies, and database management. Students round out the program by choosing finance electives that match their personal interests or professional goals. 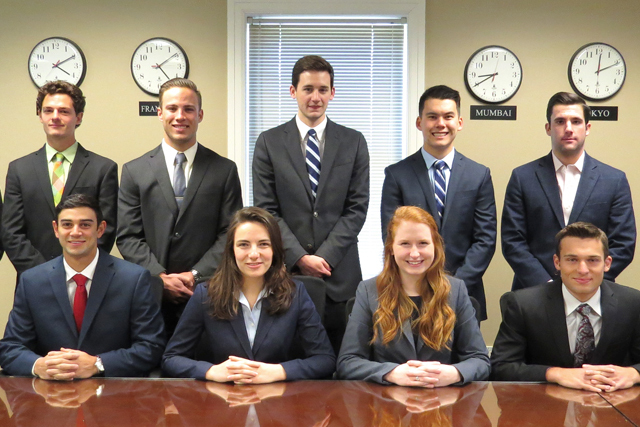 Seniors synthesize their knowledge and skills in a senior capstone experience, completing either a thesis or a business valuation project. The five-course finance minor provides a solid foundation in the field and complements almost any major. An understanding of finance is valuable in many aspects of life, both personally and professionally. A TCNJ finance education integrates the theoretical foundation of the classroom with the practical application of real-world skills. Our students graduate with a competitive edge: real experience in applying the information and technology that drive decision-making across global financial markets. Student Investment Fund is a diversified financial portfolio valued at more than $350,000 and managed by students making buy and sell decisions. Students analyze stocks and pursue investment strategies to increase returns or improve the fund’s asset allocation and risk management. Real money. Real risk. Real responsibility. Financial Learning Center gives students access to a Bloomberg terminal, the same global information platform used by finance professionals to analyze real-time financial data and monitor news on stock and bond markets. The Bloomberg terminal brings real-world relevance to class projects, independent research, and the Student Investment Fund. Students can also jumpstart their careers by completing the Bloomberg Essentials and Bloomberg Market Concepts training programs. 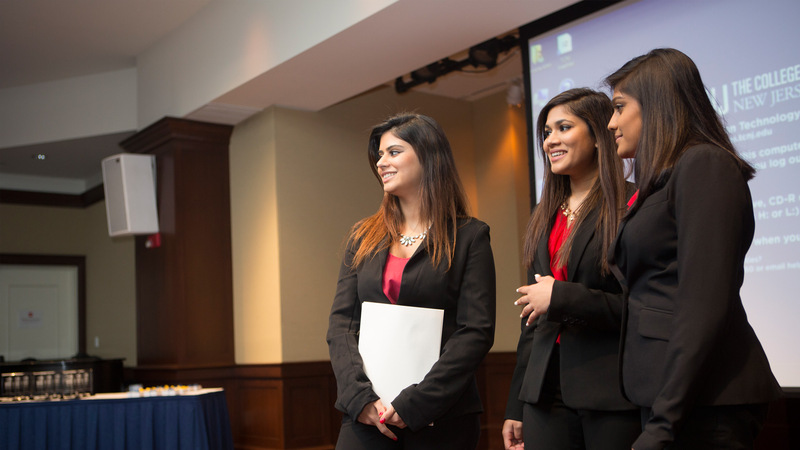 Mayo Business Plan Competition gives student teams the chance to pitch viable business plans to a panel of alumni and other business professionals, with $50,000 in prize money at stake. Open to all majors, the competition allows finance students to collaborate with peers in other disciplines—from marketing to multimedia—on a team-based project, modeling business world practices. Global Study Abroad immerses students in the reality that markets are now international, with data and dollars crossing time zones 24/7. 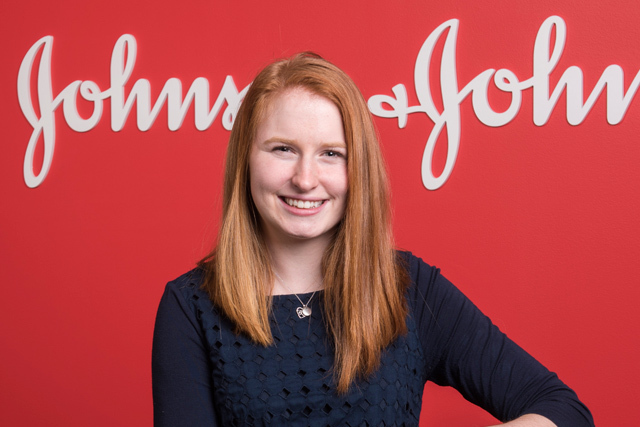 Studying abroad to gain firsthand perspectives on the global marketplace is invaluable for finance majors. TCNJ offers dozens of study abroad opportunities; in most cases, courses taken abroad count toward the finance program’s requirements. Students leverage our proximity to the financial centers of New York City and Philadelphia to land highly competitive internships, heading to J.P. Morgan, Ameriprise Financial, Bloomberg Financial Services, CIT Group, Goldman Sachs, Johnson & Johnson, Merrill Lynch, Morgan Stanley, and other top firms. These internships frequently turn into offers of full-time employment, contributing to our graduates’ strong track record of first-job success. Finance majors work in banks, financial institutions, brokerage houses, major corporations, and government settings. Recent graduates have received offers from Bank of America, Bloomberg, CIT Group, Goldman Sachs, BlackRock, Johnson & Johnson, J.P. Morgan, Merrill Lynch, and each of the Big 4 accounting firms. Our graduates successfully sit for the difficult exams required to earn such professional designations as chartered financial analyst (CFA) and certified financial planner (CFP). Many finance majors choose to pursue a JD or an MBA after graduation. In addition to law and business, students enter graduate programs in a wide variety of fields, including health services, statistics, public policy, and accounting. Our graduates are accepted into programs at top schools, including Columbia, Penn, Duke, and NYU. Our alumni are enthusiastic supporters of the program, visiting campus and networking with students. They serve as guest lecturers and participants in case studies for our classes and also provide data and information for use in class projects. Our alumni connect current students and new graduates with internship and employment opportunities. Faculty members keep in frequent contact with our alumni, who graciously give back to the program, nurturing an active TCNJ finance community.